We live in southern Minnesota and have just opened our cattery. 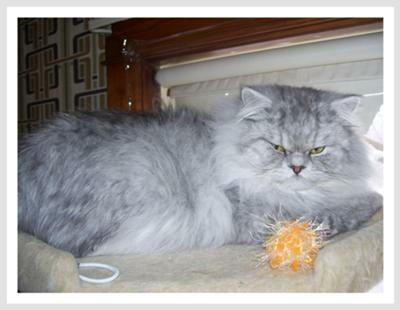 We have one Dam, a Seal Point Himalayan and our Sire is a gorgeous Silver Tabby Exotic Longhair. My husband loves the Persians as much as I do, we also have a very chatty African Grey parrot, a Chihuahua, an aquarium and a very tiny dwarf hamster. It is like Noah's Ark around here, and we love it. The King and Queen live in their upstairs condo, they have two rooms connected by a pet door. This way when Nadira is ready to have her litter we can separate them so Mom can have alone time with the babies.